July 2nd 2015 : Sevenoaks, Kent, United Kingdom - Underwater Lights Limited again expand their already comprehensive portfolio of lights with new Marlin surface mounted lights, with ease of installation a key factor. Proving the company’s Research and Development extends to smaller craft, this surface mounted light is ideal for smaller craft with its simple non-cutting installation and simple plug and play system utilising an integral driver. Offering 2800 lumens of brightness, the lights give a wide 60 degree angle of beam making them ideal for Superyacht tenders, pleasure boats or even fishing boats. With electrics bonded through the power cable the lights give 40,000 hours of LED life and can be purchased in pairs. The Marlin light range join an impressive line-up of marine products from Underwater Lights including retro fit items meaning any UWL equipped vessels can be upgraded to the latest LED technology. Brilliant ideas from Underwater Lights with brightest LED yet! March 12th 2015 : Sevenoaks, Kent, United Kingdom - Underwater Lights Limited announce new products combined with advanced techniques for 'retro' installation, giving shipbuilders and boat owners yet more opportunities to illuminate their vessels. Over the winter a 100 and 160 metre Superyachts have been upgraded to the high powered Retro underwater lights without hauling the boats from the water. With the ‘spotlight’ firmly on the Yacht Refit industry, Underwater Lights Limited remain the number one choice for deck and underwater lights. Recent projects include the stunning ‘Il Vagabondo’, utilising the powerful QT LED 75 underwater lights fitted by Ursa Shipyards, Turkey. Chosen for their illumination, ease of installation and modular design, the LED light range from the renowned British company continues to be used worldwide by large shipyards and individual customers alike in both new commissions and refits. With ultra high levels of luminosity, 9600 lumens, these LED lights have an incredibly long lifespan of 40,000 hrs, both all important criteria in this environment. The unique lens collects and focuses the light from the LED chip into a crisp 87 degree light beam that makes the QT LED 75 stand out from our competitors. The same LED is fitted to the QT LED 130 for installation into composite (G.R.P and Carbon Fibre) hulls. Underwater Lights Limited expand ‘Cute in Size Big on Light’ philosophy as they unveil the ‘QT80’ range of submersible marine lights. Produced to exacting R+D standards, the QT range is an expansion of the current UL TI MATE underwater light range from this world renowned marine lighting company. These ‘through hull’ submersible marine lights have been tested to 10 bar pressure and are suitable for installation in both GRP-fiberglass and wooden hulls. The light housing Bezel is created from super tough Aluminium Bronze and 5083 Aluminium whilst the lens is produced from Borosilicate glass, with all components surpassing industry norms. The LED lamp itself has a 20,000 hour light life (at 60 C degrees) and delivers 5,500 lumens of output. The LED has a choice of light colors and is available with three different types of lenses for a range of beam widths. This light system has been specifically produced to be driven at low outputs to suit boat battery power whilst maintenance of the LED is carried out from inside the hull. The QT80 range of lights add to Underwater Lights Limited impressive product portfolio designed for owners of small tenders up to the World’s greatest Superyachts. Shipyards the world over have come to trust the quality of the Underwater Lights brand, with the company’s products being featured on such outstanding, award-winning superyachts as the MY Anna, MY Solemar, MY Llona, SY Maltese Falcon, MY Kismet and MY Serque. Underwater Lights™ Limited products are produced in Marine Grade high-pressure tested materials including 316L Stainless Steel , Aluminium 5083, Aluminium-Bronze, Titanium and complex plastics. Bezel Material - Aluminium Bronze & 5083 ALU. For more information on Underwater Lights™ Limited and for high-resolution images please contact: Harley Stephens – underwaterlights@holeshotpr.com (Tel: 01732 761006 / Mobile: 07943 059985). For technical or business queries contact Klare Urquhart - klare@underwaterlights.com Tel : 01732 455753. Underwater Lights™ has a worldwide distribution network with regional offices in the following territories; France- Saim Marine and Kent Marine, Germany- Underwater Lights™ GmbH, Greece- Mar Cruising, Italy- Saim S.p.A Italy, Norway- Br. Hukkelberg, Spain- Total Marine Taiwan- Euro Marine Supplies, Turkey- Neva Marine Ltd, UK- Atlantis Marine, USA- Underwater Lights™	Limited, Inc. Plasma Technology - Underwater Lights™ Limited Leads The Way! Leading Marine lighting company Underwater Lights™ Limited is proud to unveil their ‘PLASMA’ lighting range which they will be showcasing at the world renowned Fort Lauderdale and METS Marine shows. With shipbuilders and owners looking for the latest technology, Underwater Lights™ Limited have developed this industry leading lighting system with the company looking for feedback during the Marine exhibition period. Not only do Plasma lights have a distinctive look all of their own, the latest generation of plasma lighting is the most energy-efficient light source for outdoor, commercial and industrial lighting. This is due not only to their high system efficiency but also to the small light source they present, enabling very high luminaire efficiency. Underwater Lights™ Limited have also developed a 100watt flat chip adjustable LED underwater light and the new flush underwater light for sailing yachts and GRP hulls. Underwater Lights™ Limited welcome all visitors and feedback at FLIBS (Stand 790) and METS Stand - (Superyacht Pavilion 10-104) events. Shipyards the world over have come to trust the quality of the Underwater Lights™ brand, with the brand’s products being featured on such outstanding, award-winning superyachts as the MY Anna, MY Solemar, MY Ilona, SY Maltese Falcon, MY Kismet and MY Serque. The luxurious, 132 foot Serque features six elegant staterooms, wood panelling throughout, a six-person spa, two jet skis and a 47 Intrepid Sport Yacht for diving and fishing. Refitted at the Fort Lauderdale Marine Centre, this magnificent yacht now has 32 UL Ti MATE 75 SA 150 watt Underwater Lights™	installed. The exterior of the boat is shown off by the LED lighting, along with a range of downlights and mastlights. Underwater Lights™ Ltd products are produced in Marine Grade high-pressure tested materials including 316L Stainless Steel , Aluminium 5083, Aluminium-Bronze, Titanium and complex plastics. Recently refitted at the Fort Lauderdale Marine Center, this magnificent yacht now has 32 UL Ti MATE 75 SA underwater lights installed. The exterior of the boat is shown off by the LED lighting, along with the range of downlights and mastlights. We have developed an interactive product brochure showcasing our entire range of original Underwater Lights™, which is available online or on CD. Click here to view online, or call us on +44 (0) 1732 455753 and we'll send you the CD version. Underwater Lights™ Limited, makers of the original Underwater Lights™ since 1991, have further extended their distribution network by opening an office in Dania Beach, Florida. The Original ‘through-hull’ submersible lights from Underwater Lights™ Limited, are now available from the company’s new subsidiary, Underwater Lights™	Limited, Inc, based at the Royale Palm Yacht Basin in Dania Beach, just south of Fort Lauderdale, USA. Manufacturing of the lights continues to take place at Underwater Lights™ GmbH, based in Bremen, Germany, to ensure that the highest quality product is produced for customers worldwide. The new US company is headed up by Martyn Bignall who has vast experience in the marine industry, as well as in sales and marketing. He has worked on the construction of world-class offshore powerboats and one-off race yachts and was involved in the launch of a matched resin system for boatbuilding. In 1989 he established Martel Composites in the UK, latterly known as Martel Wessex Composites Ltd after the buy-in of shares from Wessex Resins and Adhesives. Martyn resigned from that company in 2004 to establish another marine panel manufacturing business in the US. For further information contact Martyn in the USA on 001 954 663 9450. Underwater Lights™ Limited would like to congratulate Atlantis Marine Power Ltd, our sole UK distributor, on being honoured in the Sunseeker Supplier of the Year List with the Bronze Award for Quality, Delivery, Customer Service and Innovation during the ceremony at the Southampton Boat Show. 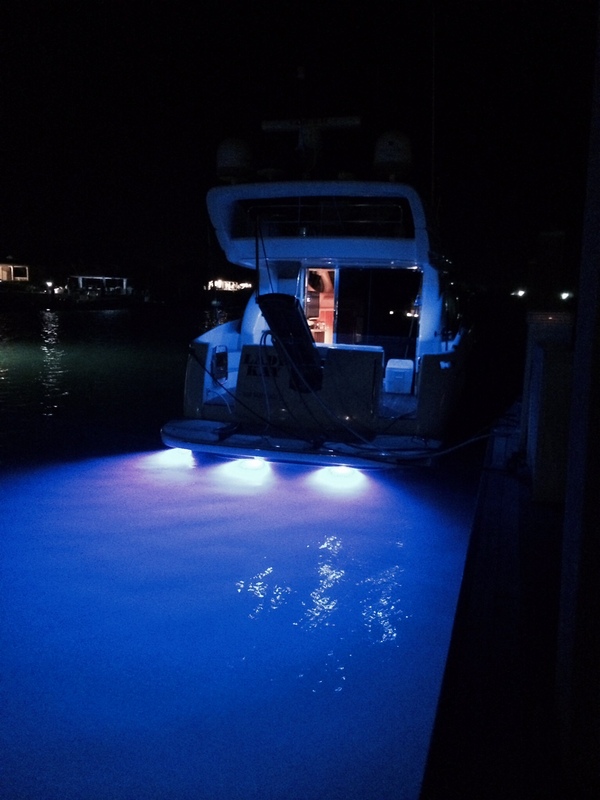 Atlantis Marine Power have worked in partnership with Underwater Lights Limited supplying many large boatbuilders in the UK with the original Underwater Lights™	for the past 5 years. SY Maltese Falcon with the Original Underwater Lights™	Brand of submersible 'through hull' lights installed. Pictures courtesy of George Gill. Underwater Lights™ Limited, makers of the original Underwater Lights™ since 1991, have further extended their distribution network in Europe by signing new distribution contracts for Italy and Norway. Milan based Saim S.p.A, has exclusive distribution for Italy, San Marino, Monaco, Malta and Croatia with immediate effect. The contract also extends into France on a non-exclusive basis. Saim S.p.A provides a complete range of nautical components through a network of 120 dealers and develops customised solutions through its skilled team of R&D engineers. The products designed and manufactured by Underwater Lights™ Ltd are also now available in Norway through Brödr. Hukkelberg based in Aukra, which has a 60 year history of shipbuilding in the region. Both firms will carry the UL Ti MATE range of Underwater Lights™, comprising of the UL Ti MATE 80 and the adjustable UL Ti MATE 75 SA and UL Ti MATE 130 SA. Peter Urquhart, founder and CEO of Underwater Lights™ Limited, which is based in UK, said of the move “I am delighted to announce these additions to our fast expanding distribution network, and I am sure that both partnerships will enable us to improve the service we offer to our important European customers”. Underwater Lights™ Limited would like to congratulate Redman Whiteley Dixon Design, Amels and all concerned in the build of MY Ilona which has recently won the the “Best Motoryacht Over 43 Meters” award presented on February 16 2006 at the Miami International Boat Show. MY Ilona has the original Underwater Lights™ installed which was designed, manufactured and supplied directly by Underwater Lights™ Limited UK. Peter Urquhart, Managing Director, of Underwater Lights™ Limited also worked closely with Amels in obtaining Lloyd's Approval for specially designed underwater lights which were installed in the fuel tanks.